Arnoux (are-know) Goran was raised by two deaf crack addicts and left for dead at 22. He now lives a J. Paul Getty life in the OC. Arnoux was devasted in every way which drove him to find a way to heal himself and to stop replaying the patterns of poverty, starvation, and depression from his childhood. 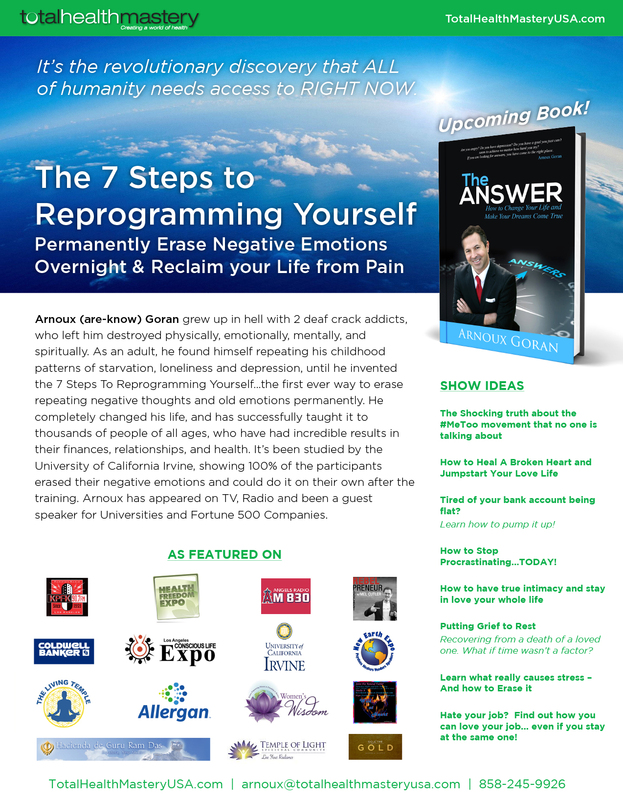 After years of research, hard work, resilience and prayers he “cracked the code” of the human mind and invented The 7 Steps to Reprogramming Yourself, the first ever proven method to access the unconscious mind and remove old repeating negative thoughts and emotions… permanently. The 7 Steps was studied by the University of California, Irvine where they found that 100% of the participants of Arnoux’s training said that they released negative emotions permanently and that they could do it on their own after the training. A new study is currently underway on this unique, breakthrough method unlike any other. After being told by his doctors that he would never recover and would certainly die he rid himself of several “incurable” diseases and went on to design the seminar series that changes and saves lives, Total Health Mastery. Total Health Mastery University now boasts over 20 courses and is available globally online. A few live events are offered each year. Arnoux has written over 20 books or mini-books which are only available in THMU. Arnoux is also the inventor of The 5 Step Emotional Eraser, How to Cleanse the Body Without Cleansing Reactions and How to Overcome Addictions Without Willpower. 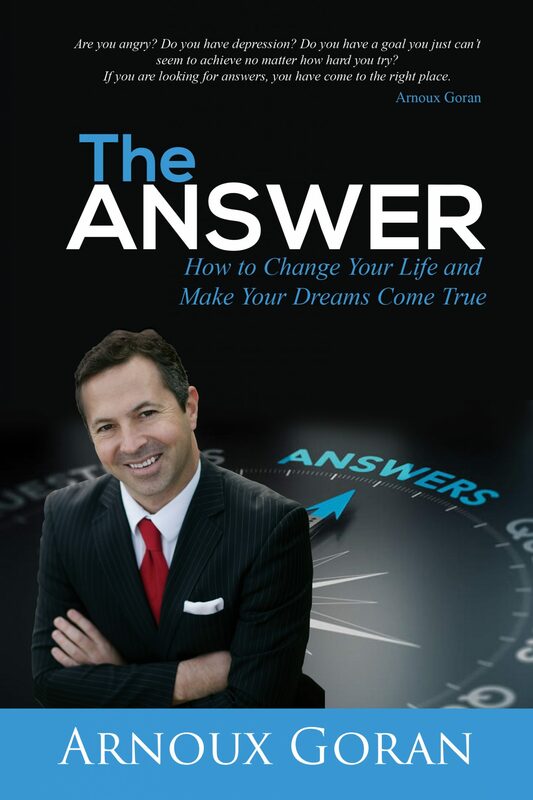 He has been a featured speaker on TV, Radio, at Fortune 500 companies and at major universities. Arnoux earned his B.S. in Business Administration from the University of Washington and then took two years of pre-med courses at UW. Arnoux is a black belt in Martial Arts and became an instructor under the tutelage of Grandmaster Won Kuk Kim, son of Bok Man Kim, co-founder of Tae Kwon Do and author of Practical Tae Kwon Do. He went on to assist in opening several successful Martial Arts schools. 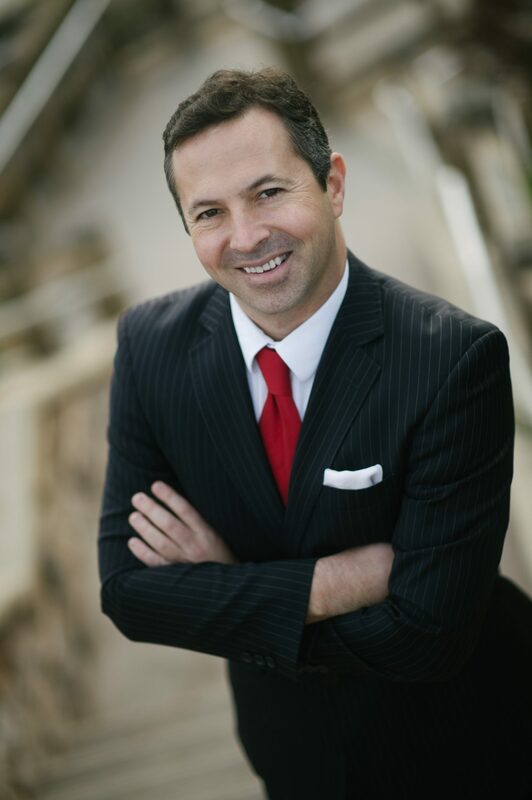 Arnoux also holds Master’s certifications in Neuro Linguistic Programming (NLP), Clinical Hypnotherapy, Timeline Dynamics, Success Coaching, Reiki and has studied virtually every method of healing emotionally, mentally and spiritually in the world… according to some experts, Arnoux has a PhD in results.